With globalization and frequent international travel, social media, and worldwide failing economies, we barely have time to say, “hello”, to one another, let alone have deep conversations about how to solve international conflicts and understand one another’s cultural differences. To avoid conflict, miscommunication, and misunderstandings, we can understand one another’s cultural differences, through better communication. Face to face dialogue could be a solution to solving many of our nations concerns. Closing night’s film, “Sketch of Mujo”, demonstrated 75 minutes of up close footage and interviews, one month after the tsunami in March 11, 2011 Japan, Miyagi, Sendai. Although there will be a handful of films about the events, “Sketch of Mujo” is the first. Click on the links below for an interview with “The Mill and the Cross”, “Hobo with a Shotgun”, and “Black Butterflies” star, Rutger Hauer !!! The winners of the festival were announced Sunday evening, and will continue to run this week at the Quad cinema. WINNER: JURY AWARD: “EVEN THE RAIN”/FRANCE/MEXICO/SPAIN, HONORABLE MENTION TO “HI-SO”/THAILAND. 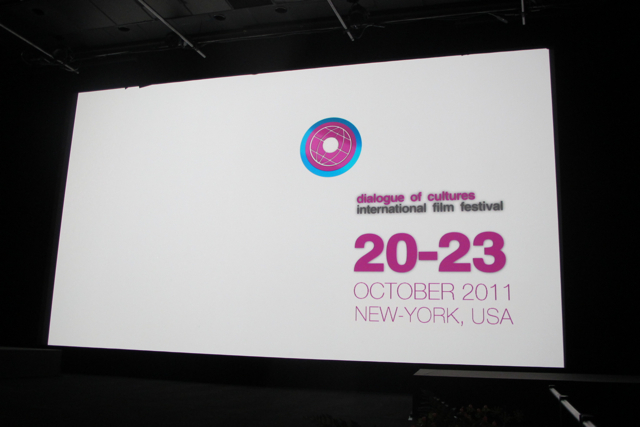 You are currently reading “Dialogue of Cultures International Film Festival” 20-27 October, 2011 New York, USA at One World Cinema.